Sebum is an oily substance secreted by the sebaceous glands in mammalian skin. Its main purpose is to make the skin and hair waterproof and to protect them from drying out. This natural oil is responsible for keeping the hair oily and shiny. However, an excess of sebum can make the skin and hair oily and begin to smell when broken down by bacteria outside the body. To deal with your oily hair, first you have to know if the excess sebum production is permanent part of your body nature (example: genes – fine hair) or the problem is only temporary due to hormonal changes, pregnancy, menopause etc .. Here are 7 tips to help you deal with your oily hair whether it is a permanent or temporary problem. Washing your hair daily makes your oily scalp worse because by doing so, you strip your hair of its natural sebum, in response your body will over produce oil to replace the natural oil it has lost. 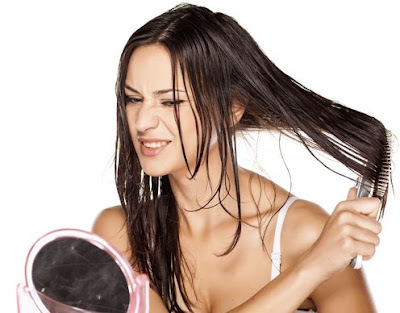 Ideally, you should go for 2 or 3 days between shampooing your hair to get the oil production under control. Also ensure to rinse your hair very well after shampooing and conditioning, rinse first with warm water to get rid off the buildup then close the cuticle with cold water to add shine. To strip your hair of the excess oil and make it look less greasy, instead of washing it everyday try to use dry shampoo or baby powder. Rub it into your roots then combine it. But if you put too much it will be hard to get rid of the whiteness on your hair, so be careful! Make sure to keep the conditioner off your scalp and rinse it very well because applying conditioner all over can totally weigh hair down causing oily roots. Over brushing can stimulate oil production and make your hair greasy. On the other hand, not brushing your hair enough keeps natural oils from being distributed and they just buildup on the scalp. The more closely your hair to your head, the more oil it comes in contact with. That’s why straight hair gives grease and oils a direct path down your hair shaft. In addition, the hot hair can stimulate more oil production. However, curling your hair gives a little more volume at the roots allowing your natural waves to shine through and helps keep the oil down. Stop touching your hair too much! By running your fingers through your hair, oil production glands become more active along with your hands containing natural oils that end up in your hair and make it greasier. Don’t buy shampoos with added oils; instead buy ones tailored for oily hair. In addition, avoid products with silicone, which can induce oily hair because they produce buildup, in stead use shampoos with higher PH (alkaline). Moreover, don’t use too many mousses and gels that can make your hair greasier.